The individualized and detailed information covering one’s unique needs, as covered in the book, is reasonably thorough. Identifying which foods, herbs, spices, etc. that either support or diminish one’s natural processes is of great value. I do have questions around the need to incorporate more up-to-date information around issues such as the impact of GMO foods, but I can overlay D’Adamo’s information with more current research and reach my own conclusions about what’s right for me. For example wheat flour is supposed to be fine for my blood type, but I had an immediate negative digestive reaction today after eating a scone. I will continue to avoid wheat flour as I have been doing for some time. 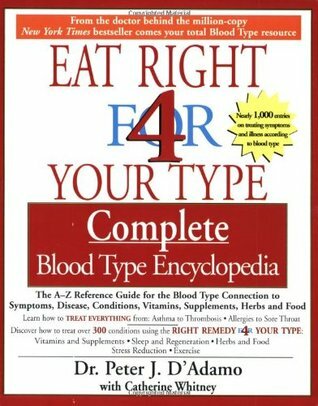 Ultimately, eating in alignment with your blood type may be a piece of the puzzle, and possibly even an important piece, but it’s not the full picture and should be taken with a grain of salt…or not, depending on your blood type. This entry was posted in Books, Food and tagged Dr. Peter D'Adamo, Eat Right 4 Your Type on June 18, 2014 by local delicious.